The roles of the Associates and the Central Pacific’s construction of the western leg of America’s first transcontinental railroad are laid out in detail in the past three articles. While the Associates risked their personal wealth in accomplishing their task, the project required far more in resources than they could muster from individual investors. The same was true of the Union Pacific’s principal owners. The Associates obtained substantial amounts of funding from California and from municipalities, but the greatest source for the national project was the federal government. It seems only fitting that President Lincoln, a former railroad lawyer, signed the first two major pieces of legislation, the Pacific Railroad Act of 1862 and a significant amendment to the Act in 1864. The 1862 legislation provided for 30-year federal loans at 6% interest, in amounts that depended upon the difficulty of the grade. The “easy grades” generated bonds in the amount of $16,000 per mile. The track in the extremely difficult mountainous regions generated bonds in the amount of $48,000 per mile. Bonds in the amount of $32,000 per mile were issued for track over the high plains. A portion of the funds were withheld until the entire line was in working order. Failure to complete the entire line by January 1, 1874, would result in forfeiture of all rights, including the entire rail line completed as of that date. In addition, the companies were granted 6,400 acres of land per mile of line completed. The companies were not entitled to mineral rights, but they were entitled to timber and stone on either side of a 400-foot right-of-way. The 1864 legislation allowed the companies to float their own 30-year bonds at 6% interest, on which the federal government paid the interest the first year and guaranteed the interest payment for the next nineteen years. Authorized amounts ranged from $24,000 to $96,000 per mile. To enhance the marketability of the companies’ bonds the 1864 legislation gave the company bonds first-mortgage status over the government-issued bonds. The legislation also allowed the Central Pacific to extend its track 150 miles across the Nevada line, assuming the Union Pacific did not get ahead of them. Important to both companies, the forfeiture provision was removed. An 1865 amendment, signed by President Andrew Johnson on July 3, 1866, dropped the restriction against the Central Pacific going 150 miles beyond the Nevada border, allowing the companies to lay track as far as they could until the two tracks met. 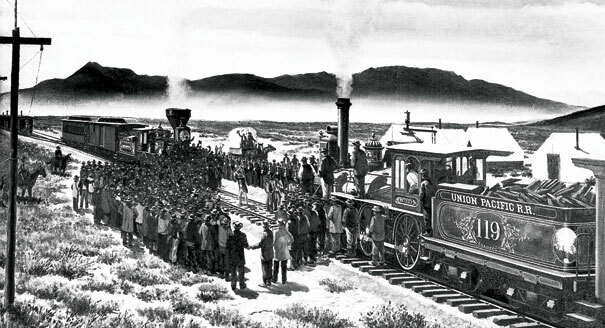 The race was on and would not end until the driving of the ceremonial golden spike at Promontory Point, Utah, on May 10, 1869, well before the 1874 deadline set in the 1862 Act (but removed in the 1864 amendment). One may argue whether the legislation was too generous to the railroad companies, but there is little doubt that few investors would have taken on the task without the government subsidies. Much of the West would have remained isolated without the railroad. Before the railroad, goods were shipped either around the southern tip of South America or across Panama. To put matters in perspective, it took upwards of three weeks just to ship mail between New York and San Francisco. Completion of the transcontinental railroad reduced the time to ten days. Sources: Bain, Empire Express; Lavender, The Great Persuader; Central Pacific Railroad Photographic History Museum, www.cprr.org.